It seems that 2007 is going to be a busy year for weddings. Not only are Julie and I taking the plunge but several of our friends are also venturing into this thing called marriage. This weekend we are in Virginia Beach to support two of our closest friends Francis and Jill, who are having their wedding at Francis’ parents place. 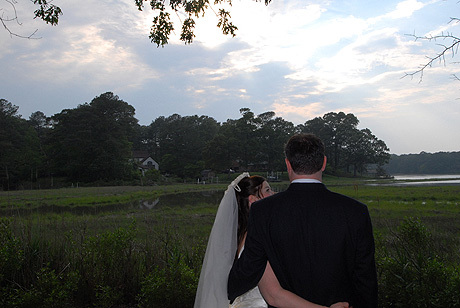 It is a very nice setting for a wedding (on the water with lots of trees and big tents)… It should be a great show!! I normally don’t shoot weddings… some people have a real knack for taking pictures of people all dressed up and others (like myself) are more inclined to be shooting fish or large marine animals who smile at you all the time! This time I made an exception and brought my camera along just for kicks. I was really surprised how nice the photos I took turned out… I didn’t really think I would shoot many pictures so I didn’t bring a large zoom, just my 12-24 mm Nikkor wide angle lens (I will know better next time). After I posted some of the photos online I received emails from friends commenting on how nice they turned out and asking how they could get prints… so I put together a DVD of all the image files and gave it to Francis and Jill as one of their wedding presents from Julie and myself. They Loved It… at least that’s what they told me ;-)!! I am going to shoot two more weddings later this year… stay tuned! !